Tools and support materials are available to Alliance Partners, Sponsors, and others to assist in efforts to promote Choose Civility. Numerous tools have been created and are available for free from the Choose Civility Alliance Partners, at Library branches, and through participating organizations. 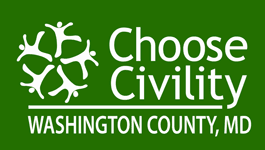 Choose Civility Web Site - This site offers a variety of information, news, tools, partners, and other opportunities to embrace and get involved in Choose Civility in Washington County. Choose Civility Presentation - A PowerPoint presentation has been designed by our Speakers’ Bureau. The presentation outlines information about the initiative. Speakers can be scheduled to present to a business or organization. Please contact Sarah Hull at 301-739-3250 x168 or shull@washcolibrary.org to schedule a presentation. Car Decals - Courtesy of Dr. Tony Dahbura and Hub Labels, Inc., the decals are available for free at any Washington County Library branch, or from Choose Civility Alliance Partners. Contact Sarah Hull at 301-739-3250 x168 or shull@washcolibrary.org to request decals sent through the mail. Civility Certificates and Banners - Choose Civility Washington County is in the process of developing special certificates that businesses and organizations can use to honor individuals who model civility. Additionally, banners are available for each Alliance Partner to display to patrons reminding all that their workplace is a member of the initiative. Choose Civility Book Lists – The following book lists were created by the Washington County Free Library.